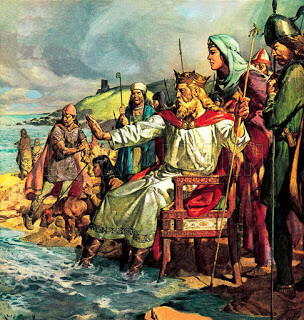 There is a wonderfully enchanting (or old English) story or legend, told by a twelfth century English historian, named Henry Huntingdon, of a time when the English king Canute set up his throne beside the sea. And when he sat upon his throne, he proceeded to command the waves and tide of the sea to advance no further. And when the tide or waves of the sea refused to obey his royal command, it is said that he stood upon his feet and addressed his courtiers, saying "Let all men know how empty and worthless is the power of kings, for there is none worthy of the name, but He whom heaven, earth, and sea obey by eternal laws." In the making of modern legends, today, there is another, and equally futile, attempt, by the academic-political elite, to command the God-created/God-established boundaries of race, language and nation to proceed no further and to cease once and for all. However, unlike king Canute, who was both wise and humble enough to recognize the earthy limitations of his royal power, these ruling elites, on the other hand, have been so blinded and bewitched by their own false sense of self-importance and political power and influence that they fail to see the utter futility of their efforts in trying to stay the hand (or tide) of God with respect to His "eternal laws" of race, language and nation. In the seventeenth chapter of the Acts of the Apostles, we read of St. Paul conversing with "certain philosophers of the Epicureans, and of the Stoics" on Mars Hill, in Athens. And when he rose up to speak, he declared unto them that God hath "made from one [man or blood], every nation of mankind to live on all the face of the earth, having determined their appointed times, and the boundaries of their habitation." Thus, we can clearly see, from this short passage of scripture, not only the God-ordained/God-created universality and origination of the "one" human race but also the God-ordained/God-created diversity of the human races at the same time. That is, a wonderful diversity of races that are both founded upon and expressed within that "one" race, and, with each race being accorded, providentially, their appointed time and particular place on the earth. The wonderful words of wisdom contained within this passage, and that the multicultural-intelligentsia would do well to heed, are the words "made" and "determined." In other words, it is God (and not the cultural Marxists) who has both "made" and "determined" (like the waves and tides of sea) the "eternal laws" of race, language and nation. Therefore, or from a Christian perspective, at least, any who would dare to attempt to undo (or to uncreate) what God has "made" and "determined" are not only being futile and foolish in their vain imaginations but also are rebelling against God through their anti-creational (demonic) ways. When it comes to a biblical and/or theological conception of "nation," the Word of God clearly reveals that a nation is that which is essentially bound-up with the concept of a particular race. And the biblical concept of a particular race is intimately bound up with the historical genealogy and/or genetics of a particular "family" of the earth. And the biblical concept of "family" is, in turn, genetically traceable to a particular "father." For example, the Jewish or Hebrew race, as a particular people or nation, is collectively described, in Scripture, as being nothing more than that of the Abrahamic "family." That is, since the Jewish race, nation or "family" has descended genealogically (or genetically) from a single "father," known as "father Abraham." And so, or likewise, it is the same for all of the wonderfully diverse and divinely-created, racial nations (or racial "families") of the earth. Moreover, this divinely ordained (or genetic-familial) law of nation, as a genetic-race (or racial "family"), is clearly revealed in the Table of Nations contained within Genesis, Chapter 10. Thus, or once again, all of the wondrous and/or God-created diversity of the various, national "families," "kindreds," "tribes" and "peoples" of the earth, today, have their genealogical (and/or genetic) source or origination, after the Great Flood, in Noah and his three sons, Shem, Ham and Japheth. In ethnographically tracing the Table of Nations (i.e. as a divinely determined, micro-creative, evolutionary process over time, or over many generations), the Caucasoid/Indo-Europoid, Indo-European, Indo-Germanic, or Indo-Aryan "families," "kindreds," "tribes" and "peoples" can trace, by and large, their micro-creative or evolutionary-genetic and genealogical origins to Japheth. Likewise, the Semitic (or Shemite) "families," "kindreds," "tribes" and "peoples can trace, by and large, their unique or particular micro-creative or evolutionary-genetic and genealogical origins to Shem. And finally, the Australoid, Negroid and Mongoloid "families," "kindreds," "tribes" and "peoples can trace, by and large, their micro-creative or evolutionary-genetic and genealogical origins to Ham. 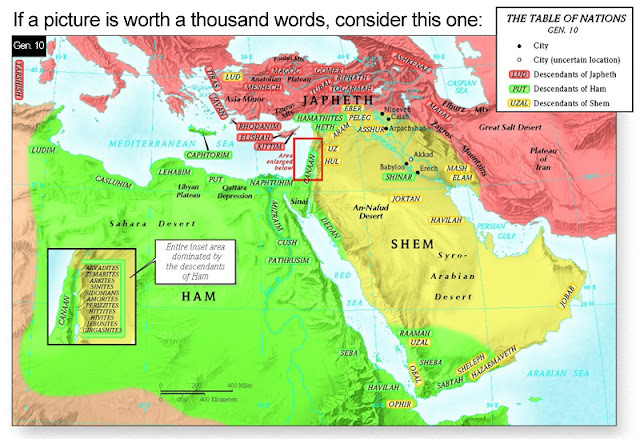 Though the biblical concept of the wondrous diversity of nations is essentially (or primarily) based upon a God-created diversity of racial-genetic "families," and located or placed, providentially, in different geographical regions of the earth, and which can be ethnographically and/or genetically traceable to Shem, Ham and Japheth, via the Table of Nations, it is also, or at the same time, intimately connected with or based upon a divinely ordained/divinely created diversity of languages or tongues as well. That is, a God-created diversity of languages or tongues, bestowed upon Mankind at the tower of Babel (Genesis 11), as a secondary substrate of nationhood, and, which, in turn, is built upon the primary substrate of nationhood as diverse, racial-genetic "families." Note: Biblically speaking, it is important to note that before the tower of Babel (Genesis 11:1), there was no diversity of languages or tongues, as we have come to know and experience them today, but only "one language" and "one speech" (or dialect). That is, it would appear that God had not yet endowed Mankind, under the determination of His eternal-creative Word, with the power and/or capacity for linguistic diversity — and possibly even the power and/or capacity for genetic-racial diversity as well — until after the time of Babel. Thus, a Christian-biblical concept of all the wondrous and diverse "nations" of the earth, together with their divinely ordained "boundaries and habitation," is clearly revealed, in scripture, and once again, to be fundamentally based upon a God-ordained/God-created racial-genetic and linguistic diversity of "peoples." That is, a diversity of "peoples" who both belong to as well as share in a particular, racial-genetic and linguistic "family" of the earth — and not some kind of self-destructive, abstract, progressive-liberal concept (or mutated, liberal-Marxist principle) of a common, universal and multicultural, "civic" citizenry that exists only in some imaginary, as well as demonically engendered, future-utopian world. Lastly, and as I alluded to above, any attempt to move away from this God-ordained/God-created understanding of a true conception of a national self or national identity — an identity firmly and fundamentally based on race-genetics and language — and to replace it with a mere, abstract "civic" concept of a common-universal "citizenship," which, in turn, is based on (so-called) universal, human rights, can only and ultimately lead to a racial-genetic and linguistic (i.e. national) self-destruction on a global scale.